Blackinton B1011 Round 5 Point Star Badge - B1011 - 1 1/3" x 1 1/3"
Home > Blackinton > Police Badges > Star Badges > B1011 Round 5 Point Star Badge - B1011 - 1 1/3" x 1 1/3"
B1011 Round 5 Point Star Badge - B1011 - 1 1/3" x 1 1/3"
The Blackinton B1011 model badge is round and features a center five point free-floating star. Personalize this shield with your department and rank by adding up to two lines of text on the top and bottom half of the circle panel. Additional space is available for you seal occupying the star's center. 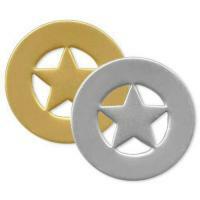 Blackinton B1011 Round 5 Point Star Badge measures 1 1/3" by 1 1/3" and is manufactured in the USA. Please allow 4-6 weeks for delivery. Round 5 Point Star Badge - B1011 - 1 1/3" x 1 1/3"
Shield with Sunburst and Wreath - B329 - 2" x 2 5/8"
Shield Badge with an Eagle - B968 - 2 5/8" x 2 5/8"
Shield Badge with Eagle - B549 - 2 1/16" x 3"
Six Point Star with Eagle - B546 - 2 1/8" x 2 1/2"
Shield Badge with Eagle - B529 - 1 1/2" x 1 7/8"
Shield Badge with Eagle - B521 - 1 11/16" x 2 5/16"
Popular Shield with Eagle - B3320 - 2 7/16" x 3 7/16"
Six Point Star with Panels - B667-A - 2 5/16" x 2 11/16"
Round Badge with Panel and Wreath - B3 - 1" x 1 1/8"
©2002-2019 CopsPlus.com: Blackinton B1011 Round 5 Point Star Badge - B1011 - 1 1/3" x 1 1/3"